Tis the season for all the fall foods, and for my busiest couple of months at work so I’ve tried to really be on top of dinners when I can, and still trying to get some workouts despite it being sooo dark in the mornings now! 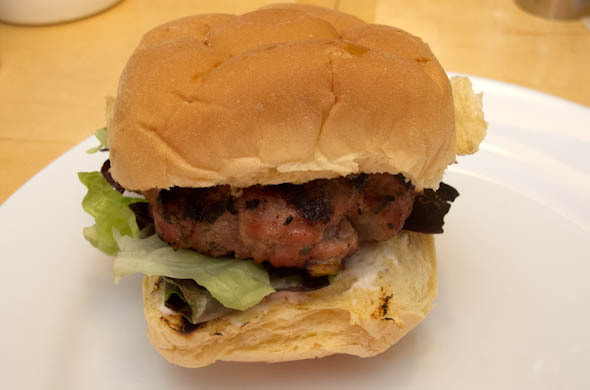 This Fall Burger had sage and pear in a pork patty for all the best fall-ish flavors. It is still great grilling weather! 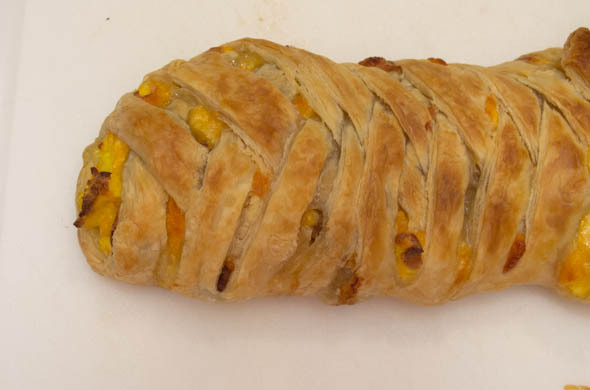 I made a breakfast calzone with braided puff pastry thanks to a friend from college’s post on facebook. It was a really great and quick for a weeknight meal. 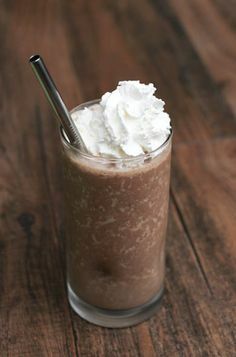 I’ll totally make this again the next time I have house guests! 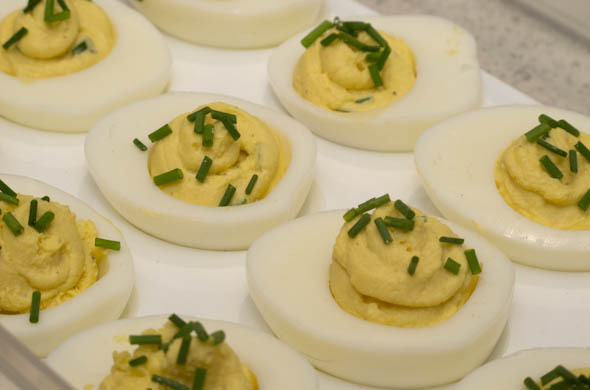 Sour Cream & Onion Deviled Eggs were fun and went quickly at a 3-way baby shower at work. He’s such a love! He likes giving us hugs and it just melts my heart. I’ve enjoyed seeing how long he’ll do some activities. We have some fun activities for halloween: a visit from Grammie C; daycare trick or treating; and maybe a jack-o-lantern thing in the park. He’s been into some pumpkin books. The little one is eating everything, even eggs on occasion! The Year of the: Seasonal Decor: Mr. J picked up some leaf garland when he saw it and it is really perfect for the mantle – also spanning the fall/halloween/harvest timing. do something a different way: I made conscious time to be social. I went to my college reunion; I joined a new local bookclub which was great; and one group had a dip-party during a Pats game. drink more water: I need to do better with this. watch more movies: we watched The Neighbors and cracked up. I’ve been super into This is Us. make working out a higher priority: I can amp this up. Work has a Fitbit challenge going on and I’ve gotten some walks in…nothing major, but something is better than nothing! My MIL is the queen of stuffed eggs so I channeled her and put a twist on the traditional deviled egg. Work was having a 3-way baby shower for 3 mommas-to-be. They seemed ideal for a snack that didn’t need to be reheated, and was easy to bring, open, and serve without any assembly. Hard boil the eggs then let cool for at least 3 hours before pealing. Slice in halves, pop the yolks out and into a bowl. 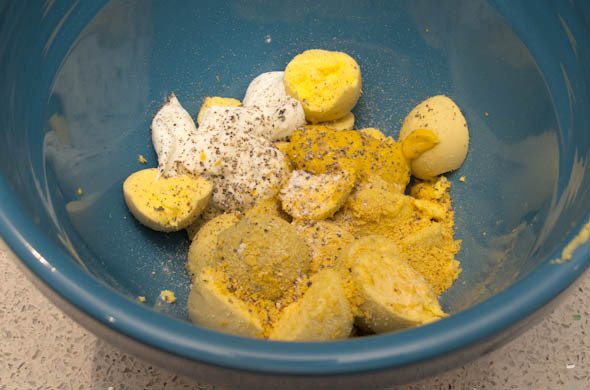 Add in the yogurt, mustard, salt, pepper, nutritional yeast flakes, onion powder, and mayo. Mix well and add in the chives. Spoon into a ziplock bag, push to the bottom corner, and snip of the corner with scissors. Pipe into the egg halves and sprinkle the remaining chives on top. 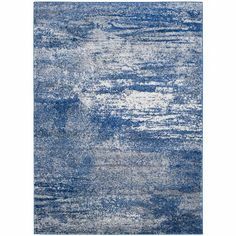 I liked these! The flavors were a bit subtle, but still there. The yogurt gave a little tang and I added the mayo for some creaminess. 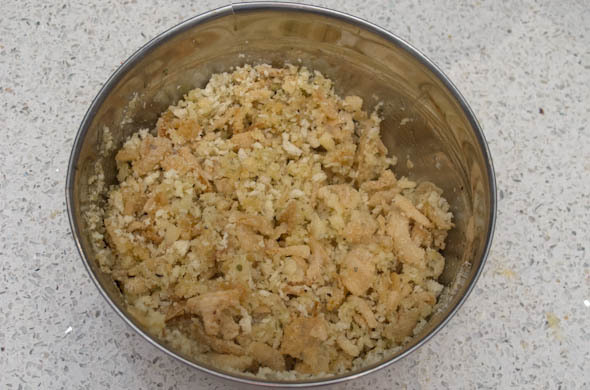 I added the nutritional yeast flakes because it kind of mimics cheese and I thought it’d help the sour cream & onion touch without dip mix or anything. I have a few more flavor options in my head. Stay tuned! 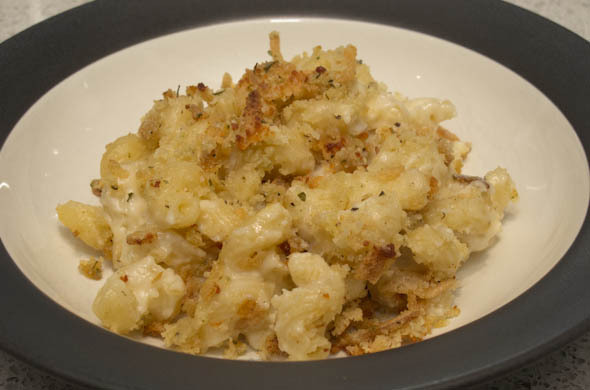 This Garlic Parmesan Mac & Cheese is not joking about the garlic. 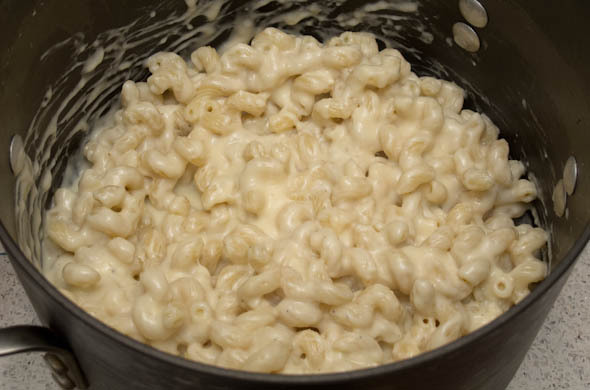 I loooove homemade mac and cheese and the garlic flavor was so great! 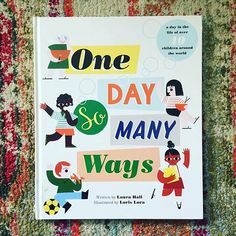 The little one hasn’t been interested in boxed Mac & Cheese but he loved this! He has good taste! 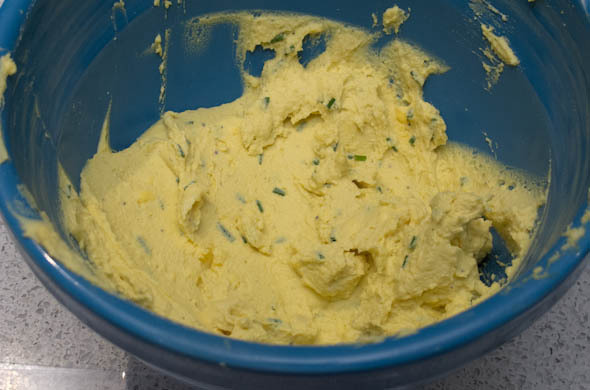 In a medium pot, melt the butter and stir in the flour. Cook for 3-4 minutes stirring the roux paste regularly. 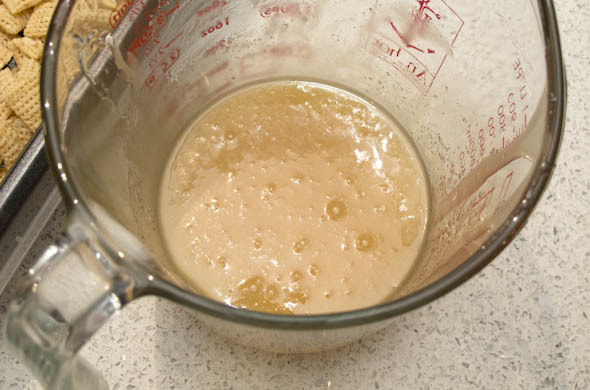 Pour in the chicken broth to the roux and stir well to combine. Then add the cream, milk, and garlic, bringing to a low boil. Add in the cheddar, gruyere, Parmesan, salt, and pepper. Cook the pasta until al dente & drain – return the pasta to the large empty pot. Stir well as the cheese melts. Add cheese sauce into the pasta, stirring to assess how much more is needed (I had some sauce leftover that I froze). Spray a baking dish with non-stick spray and pre-heat the oven to 375-degrees. Spoon half the pasta into the dish. Sprinkle the cheddar in the middle, then pour the remaining pasta on top. Bake for 15 minutes while prepping the topping. 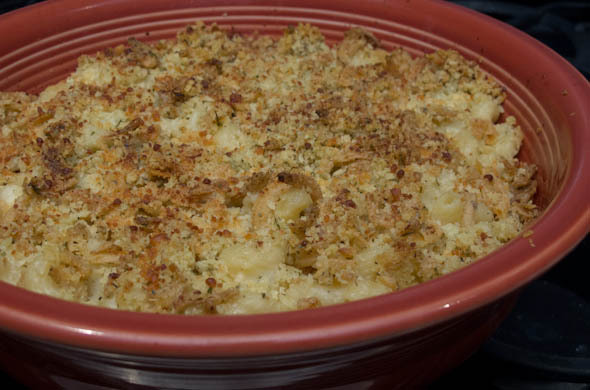 Melt the 2 tablespoons of remaining butter and mix in the panko, the fried onions, remaining parmesan, and garlic powder. 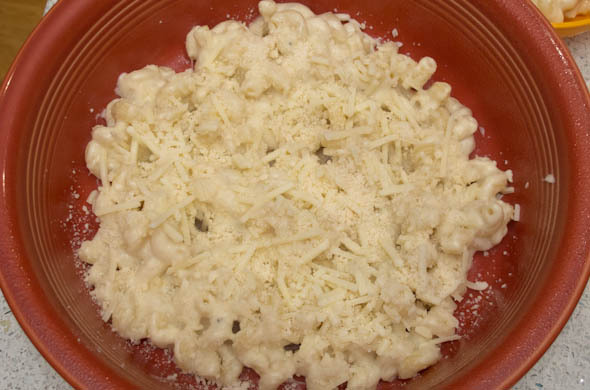 Sprinkle the topping onto the mac & cheese and return to the oven for another 15 minutes. Let sit for 5 minutes before serving. Enjoy! I loved this. It has been awhile since I made some homemade mac & cheese. The topping was awesome and was kind of an afterthought. I happened upon the Frenches Fried Onions near the panko and thought it’d be perfect. They were! Snacks snacks snacks! October for Mr. J’s year of snacks/treats was themed: “homemade.” I tweaked a Chex Mix recipe to play more on the cornbread-smoke flavors rather than how muddy-buddy/powder-y the original recipe was. I added potato sticks, almonds, and corn chips. Melt the butter and stir in corn syrup, sugar, and liquid smoke. 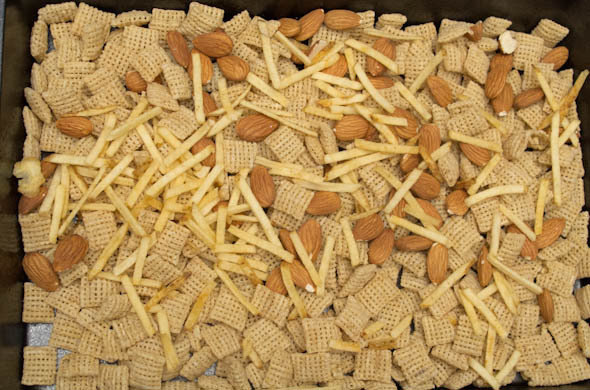 Mix together the cereal, almonds, and potato sticks. 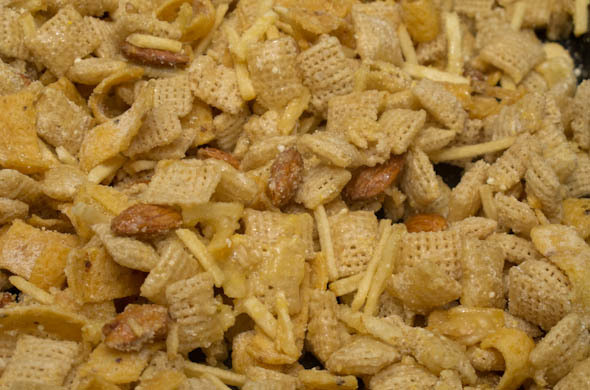 Stir the sugary sauce into the cereal then add in the cornbread mix and the chips. Pour onto wax paper to cool/dry for at least 20 minutes. 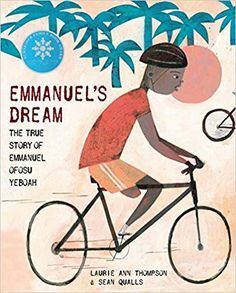 This one was subtly addictive. I liked the smokiness and the chips are the perfect salty touch. It got a bit soggy a few days later so I’m not sure how to change that. Eat quickly! Next month’s theme is chewy! Some of the most delicious things are not photogenic. This broccoli & cheddar risotto was so good but totally looks like rice-a-roni or something. 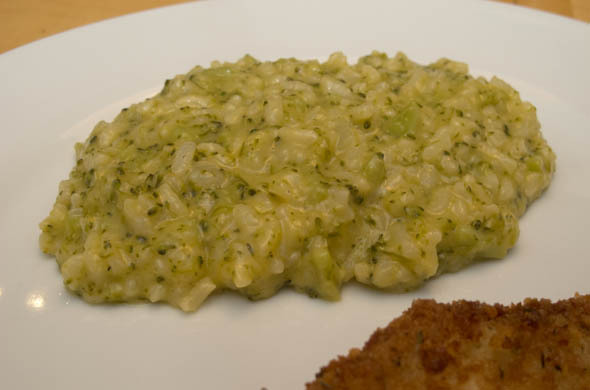 I have looooved the pressure cooker and it is so great for risotto. It simmers opened for 4 minutes, then cooks for 6 minutes. Add a few minutes for getting to pressure and releasing the pressure. Done! 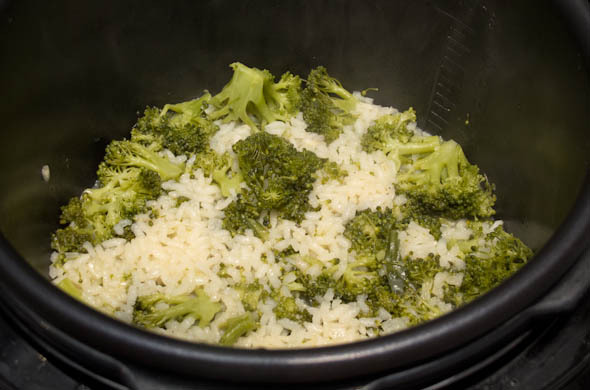 Or, you could always make rice chop up some broccoli and add some cheese. Whatever works for you! 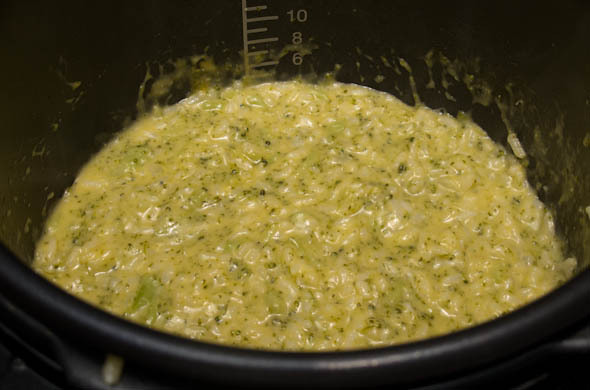 Cook the risotto in a pot or in a pressure cooker, as you normally would: (Here’s my method via pressure cooker) or (Here’s my method in a pot). I added in the broccoli to cook with the rice. 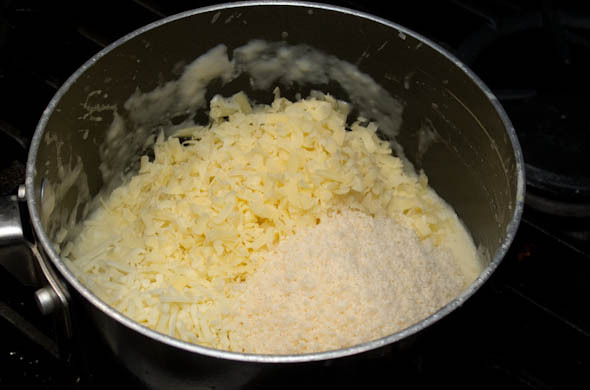 While is it hot, stir in the cheese. 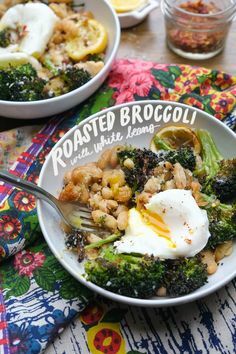 At first I was disappointed the broccoli came apart, but then it was pretty great for a very evenly creamy bite. The texture was in the rice, and it was so unbelievably creamy. The little one was into it and it is still pretty addicting as leftovers! Today’s inspiration came from my friend from college who posted his fabulous brunch. Breakfast calzone? Genius! 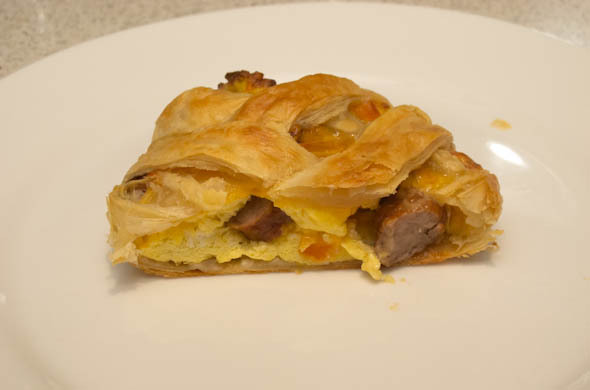 Inside the puff pastry dough, I filled it with scrambled egg, cheese, and sausage. I never use puff pastry for calzone but thought it was very breakfast-y. It was such a quick weeknight dinner, or would be a fun one to feed some overnight guests! 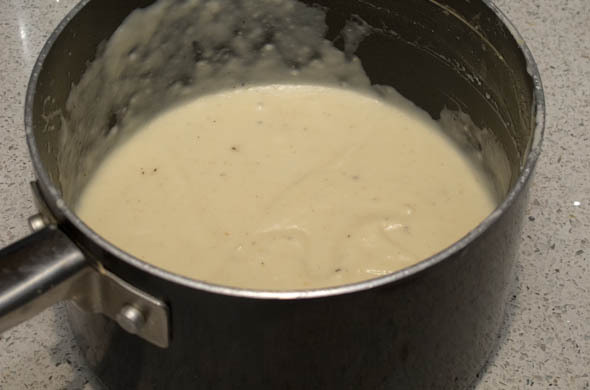 Whisk together the eggs and milk and pour into a medium pan over medium-low heat. 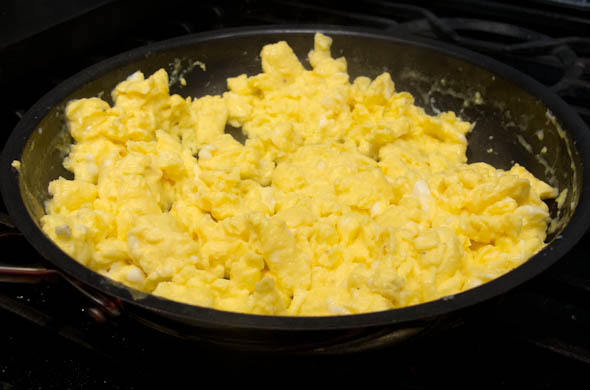 Gently cook the scrambled eggs. Add salt and pepper to taste. Remove from the pan and bring to medium heat to cook the sausage. Roll out the puff pastry maintaining the square shape. 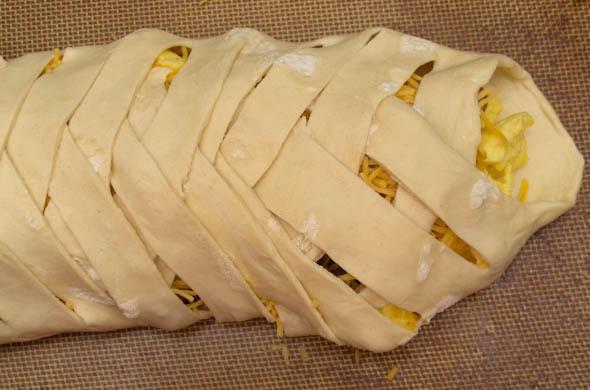 Place the pastry dough onto a baking sheet: sprayed with non-stick spray or a baking mat, or topped with parchment. 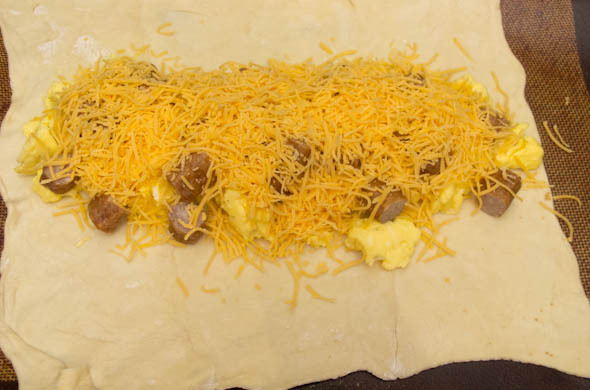 Add the eggs, sausage, cheese to the middle third of the dough all the way to the ends (left to right). Slice 1/2 slits from the top & bottom to the filling. Alternate “braiding” the strips starting on one end and crossing one, then the other side, alternating until 3/4 of the way to the end. Then start at the other end in reverse direction to close it up. Bake 20-30 minutes, until crisp and golden brown. This was so great. Puff pastry has that buttery crispness that is so perfect for breakfast. I liked the simple and classic flavors. There are 1000 ways to tweak this…with spinach/tomato/herbs or Mexican touches & salsa on the side or eggwhites or whatever else! Also, I’d totally copy my friend who put spiced fries inside as hashbrowns! So clever! 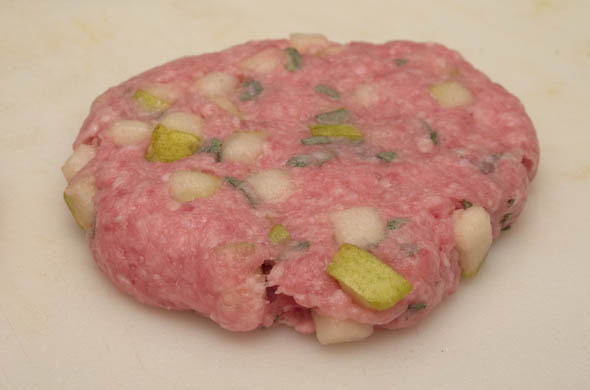 This fall burger is so fun with diced pear & sage in a ground pork burger. I thought about a grilled cheese with pear and sage and then I decided to make it in to a burger and figured pork would be perfect. It was so perfect for a fall evening. 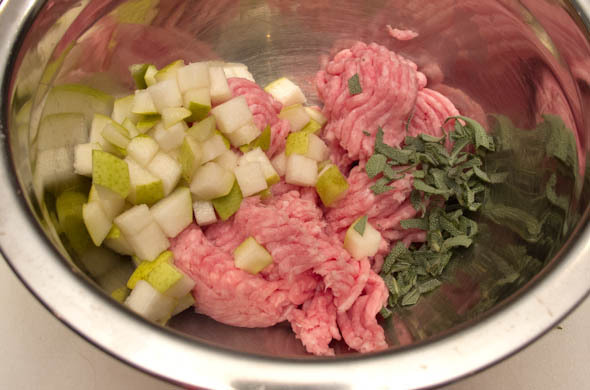 Mix together the pork, pear, and sage. Form into patties and grill or pan-sear. Be sure took cook through. Then top with lettuce, mustard, mayo, and lettuce. I wanted to be sure not to over do it on the sage. It is a strong flavor to me. I loved the raw pear that cooks slightly for a softness. I liked this one and might still make the grilled cheese version too! 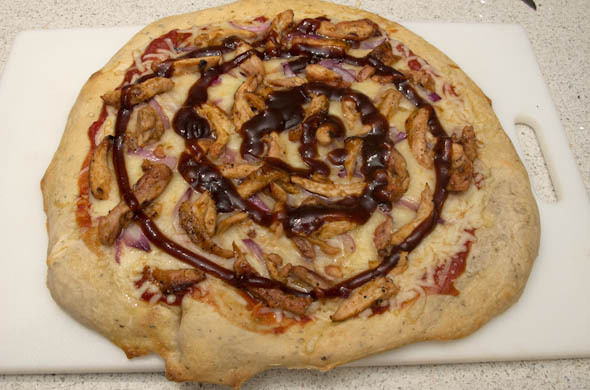 BBQ Chicken Pizza isn’t new or different BUT barbecue sauce in the tomato sauce woke this up! It was so flavorful with a sense of mystery. Where’s all that smokey sweetness coming from? Boom! 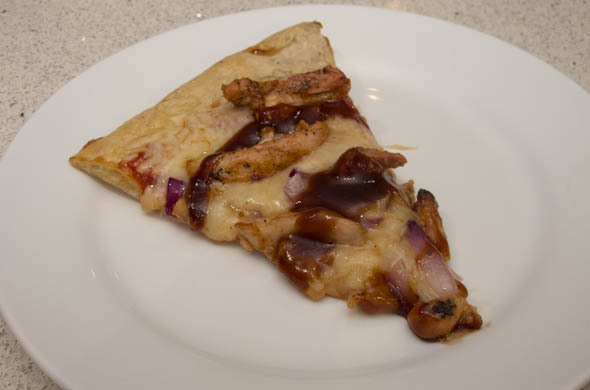 I’ve made barbecue chicken pizza before but this new one is better! Preheat the oven (and pizza stone, if using one) to 400-degrees and grill the chicken. Roll out the dough and stretch it onto the pizza stone (or pan sprayed with non-stick spray) and slice a few slits to prevent bubbles. Bake for 15-minutes until lightly browned. Warm tomato sauce with most of the BBQ sauce, reserving about 3 tablespoons for the topping. Stir well. Over medium heat, saute red onion for about 3 minutes to soften slightly but maintain a slight crunch. 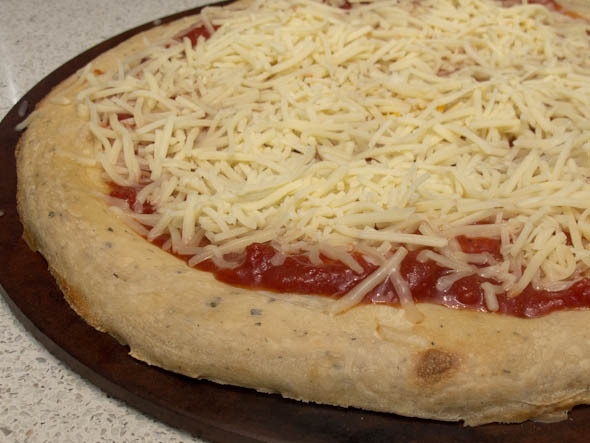 Spoon the sauce onto the dough and top with shredded cheese. 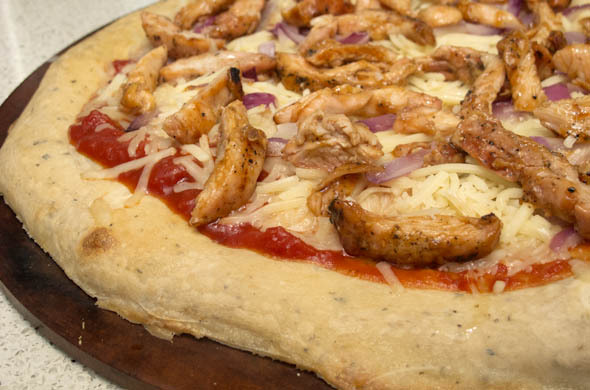 Slice the chicken and add on top of the pizza with the onion. Bake for 5-10 minutes to melt the cheese and finish crisping the crust. 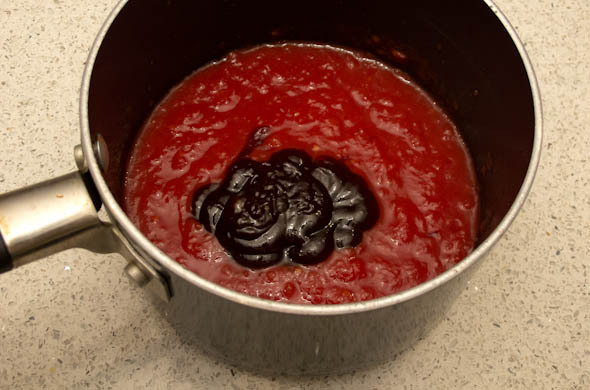 Swirl the remaining BBQ sauce over the top. It is definitely a sweet one from the BBQ sauce but with a nice smokey flavor from the sauce and the grilled chicken. I especially like these flavors as prime grilling season sort of wraps up. Plus the leftovers are so good.